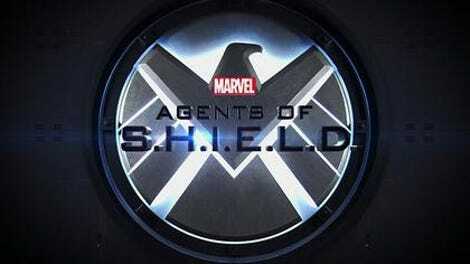 Time travel musings muddy an overstuffed Agents Of S.H.I.E.L.D. “Remember, I tried to stop you,” Samuel Voss tells Daisy and the rest of S.H.I.E.L.D., right after failing to kill her and thereby (hopefully) prevent the destruction of the earth. He’s already killed Deke’s father, and when it’s clear his fellow mutineers won’t defeat our team he kills Robin as well, all in a last-ditch effort to try and save humanity. In his mind, he’s a hero willing to make the hard call and sacrifice innocents to prevent a far greater loss of life. But if this show has a theme it’s returned to time and again, it’s that sacrifice can only come from within—it’s a choice people can make for themselves. The moment you try to decide on behalf of someone else’s life, you’re not the good guy. You’re the killer. That moment of violence comes at the end of a frantic and overly busy episode, one that spends so much time toggling between the various stories playing out both in the past and the present that it doesn’t have enough time to invest real emotional heft into anything. “The Last Day” introduces a bunch of new elements to the story through the possibility of altering time—no matter how many times Fitz insists it can’t be done—and it comes across as an abrupt info dump. I’ve watched the episode a couple of times now, and it still doesn’t all hang together as smoothly as it should, despite the best efforts of credited writers Sharla and James C. Oliver. It’s compelling to see our heroes in the future-past of 2022, dejected and disillusioned even as May tries to keep hope (and Robin) alive long enough to fix the past, and thereby prevent the future scenario currently playing out over this entire season. There’s all sort of paradoxes inherent in trying to change a past that hasn’t happened yet while living in the current version of those events, but if the show isn’t going to open that can of time-traveling worms, there’s no real sense in doing it here. Instead, the focus is on Robin, unable to tell the difference between past, present, and future. (Fitting, since the jumble of timelines right now can be a bit confusing, too.) The episode title turns out to reference Robin’s death, and the reason she was never able to see them all together, surviving the Lighthouse. 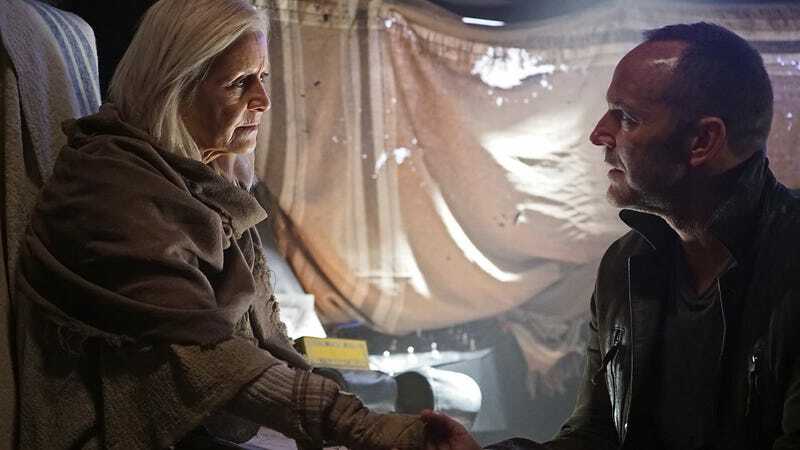 First Coulson, then Daisy, and finally May all take their turns trying to coax clearer instructions out of the prophet, and until her final breaths, it seems like Robin’s words will require some serious puzzling out. It was cool seeing her saying the same statements in the different time periods, but again, flew by so quickly that a lot of it doesn’t register. Her life may indeed remind the rest of us of how precious our fleeting lives are, but over the course of this hour the primary lesson was frustration, which only past-future Fitz seemed willing to vent about. FitzSimmons, at least, managed to provide some emotional reassurance during “The Last Day.” When they’re left alone with the portal that brought everyone to the future, they take the opportunity to get physical, a sweet moment that agains brought the focus back to the relationships between our heroes, a necessary beat rarely found during this installment. (Coulson and May hugging after being reunited at the very beginning was a good one, too.) The two of them realize the portal is capable of locking onto their past timeline; the search for the pieces of the monolith will presumably start up next week, which explains why Robin’s main instruction to May was to find Flint—the young Inhuman’s newly awakened power is clearly the key to reassembling the stone teleportation device and sending everyone home. But Flint is busy in the Lighthouse with Yo-Yo and Mack, killing a bunch of roaches and saving the remaining humans from being torn apart by the aliens. It’s a strange form of punishment Kasius has dreamt up, and one that must be tied to his plan to hightail it out of there as soon as possible, because people were previously his most valuable asset, the only means of creating further Inhumans to sell. Obviously, the Kree leader is done with those machinations. He wants off this rock, and unleashing tremendous bloodshed doesn’t do anything besides further terrify his populace. Thanks to some deus ex air vents (it is very unclear how the gas circulating everywhere magically drives all the roaches to one room), Yo-Yo gets a hero moment, slapping devices on all of them and watching them turn into dust. It may not be as kinetically satisfying as Mack chopping one’s head off with his shotgun axe, but it gets the job done. It’s looking like Mack, Yo-Yo, and Flint might be able to lead the human uprising against the Kree, freeing the last of humanity and providing a measure of optimism for those in this timeline. But once our team gets the monolith assembled and beams back down to earth circa now, that still leaves the problem of how to prevent this catastrophe. While the “how do we carry out the events of the future while still changing them enough to stop this?” plot is a pretty standard time-travel trope (one that’s possible or not, depending on which form of time-space continuum mumbo-jumbo you hitch your narrative wagon to), there seems to be the potential for a powerful emotional undercurrent to it all, once again revolving around poor Daisy. If Fitz in 2022 is to be believed, Daisy walks straight into the upcoming doomsday scenario fully intent on stopping it, and fails. The question of what successfully preventing it will require of her is open-ended, but keep in mind: This show loves a good sacrifice. It doesn’t have to be human life, it just has to be devastating. Another good (and too rare) moment of character development comes in the exchange between Daisy and Deke, when she—and he—realizes their respective fathers actually caused similar emotional drama. Good on her for sidestepping the awkward “Mine was a rage monster so we wiped his memory” thing. Hello shotgun axe, our old friend. One more question for discussion: What do you think May meant when she told young Robin, “We never have to say goodbye?” At first I assumed it was just a trite platitude meant to comfort the kid, but after past-future Fitz’ rant about how it’s like they’re stuck in an endless loop, I’m wondering if there isn’t something more implied.